On Monday, September 17th, the 17th Annual ADAPT Community Network Golf Tournament raised over $300,000 for ADAPT’s life-affirming programs and services for children and adults with disabilities throughout New York City. The event, presented by the Carmel Family was held at Brae Burn Country Club & Century Country Club in Purchase, New York and attracted over 150 golfers for an enjoyable day of golf and entertainment in support of ADAPT Community Network. The event was hosted by Scott Stanford, seven‐time Emmy Award Winning PIX 11 News Weeknight Sports Anchor & Host of Sunday Sports Rewind. 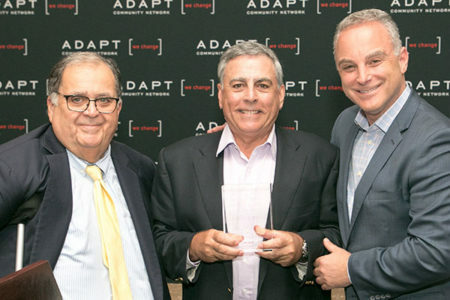 Edward R. Matthews, CEO, ADAPT Community Network, presented the ADAPT Community Network Corporate Champion Award to Jeffrey S. Weiss, President, the Weiss Group a longtime friend and supporter of our mission. The event’s success would not have been possible without the generous support of our individual and corporate sponsors including Jeffrey and Robin Weiss, Pilot RB, Colliers International, United Healthcare – Oxford, Alliance Brokerage Corp., Baker Tilly, Bella Bus, Neil Chavkin, Brothers Construction, Driscoll Foods, Edward R. Matthews, HOK, Mass Mutual, Ronald Nash, Rosemont Press, Inc., Rubin, Fiorella & Friedman LLP, Shari Aronson, Shlomo Drazin, Signature Construction, Stop Pest Control, TGI Office Automation, The Weiss Group, Titan Advisors, and the Weeks Lerman Group.